You’ll probably know that Amazon unveiled the new Amazon Kindle Fire HD the other day, and the new Android slate will command a price tag of 159 quid over here in the good old United Kingdom when the tablet becomes available on the 25th of next month, and Amazon seems to have quiet a competitive pricing strategy with the Kindle Fire HD that undercuts the Google Nexus 7 tablet by roughly 40 quid. So with this in mind the guys over at ITproportal decided to compare the new Amazon Kindle Fire HD tablet with the Google Nexus 7 to see which Android slate offers the best value when it comes to pricing, which they say that 40 quid difference in price could be somewhat illusionary. The guys start off with Amazon’s advert opt-out program,, which means when a user logs onto their Amazon Kindle Fire HD, they have the option to have the adverts removed, although this will cost the user 10-quid, roughly 15-bucks, and the opt-out will be offered as an add-on soon after purchase, and it is unclear whether the opt-out will be a one off payment or an annual fee, although apparently the opt-out scheme hasn’t been confirmed with the UK version of the Kindle Fire HD. Furthermore, apparently when you purchase the Amazon Kindle Fire HD the user doesn’t actually get a wall charger for the device, but rather Amazon has package the tablet with a basic USB cable, and for those that want to be able to plug the device into the mains, Amazon is promoting their Kindle PowerFast charger, which is compatible with all Kindles, and for the UK model costs a penny under 18 quid. So basically in other words, although the Amazon Kindle Fire HD does cost 40-quid less than the Google Nexus 7 tablet, when you add on those extras of 10 quid for the opt-out and 18 quid for the charger, you aren’t that far off that 200-quid asking price for the Nexus 7 anyway. Thus the guys say that once those extras are taken into consideration perhaps the Amazon Kindle Fire HD doesn’t look as appealing when it comes to price, and if you also take into consideration the specifications of both slates, the Google Nexus 7 easily bests the Kindle Fire HD, and then of course there is the Apple iPad Mini to contend with once Apple dishes the details later in the year. 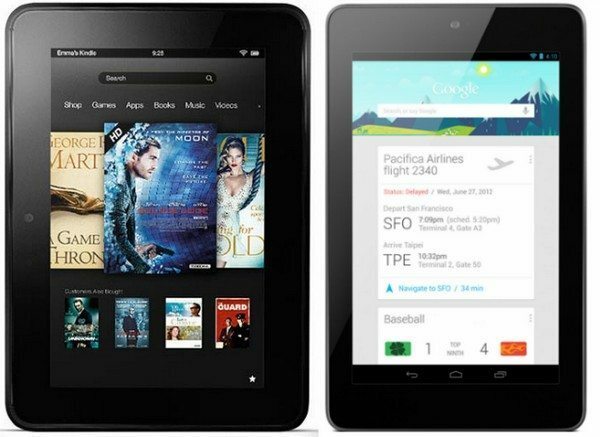 So there you go, it would appear that the Amazon Kindle Fire HD, when everything is considered, doesn’t really offer an attractive price over the Nexus 7, so which tablet would our readers prefer to own, the Kindle Fire HD or Nexus 7? Nexus 7 is much better than Kindle fire, 1. its running Android which is no doubt better than Kindle OS 2. sync with all Google services.